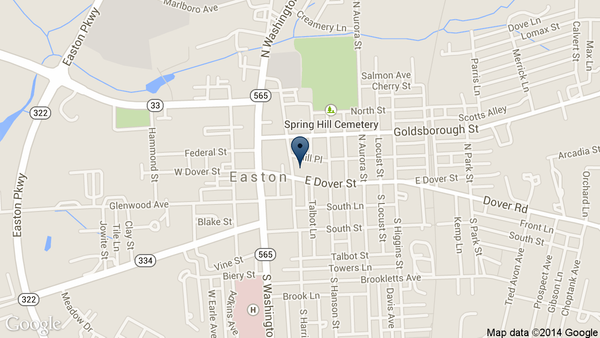 Follow Route 50 into Easton and turn right on Dutchmans Lane. Turn right onto Washington Street, past the courthouse to Goldsborough Street and turn right. At the first traffic light, turn right onto Harrison Street. The Tidewater Inn is on the left, at the corner of Dover and Harrison Street. From Annapolis, Baltimore, and Washington D.C.
Take Route 50 / 301 across the Bay Bridge. Follow Route 50 East into Easton and turn right on Goldsborough Street. At the second traffic light, turn left onto Harrison Street. The Tidewater Inn is on the left, at the corner of Dover and Harrison Street. Take 195 South to Route 896 South toward Middletown the last exit in Delaware. Turn onto Route 301 South, then Route 213 South and turn left onto Route 50. Follow into Easton and turn right on Goldsborough Street. At the second traffic light, turn left onto Harrison Street. The Tidewater Inn is on the left, at the corner of Dover and Harrison Street. Take the New Jersey Turnpike to the Delaware Memorial Bridge. Follow Route 13 / 301 South to Route 213 South, and turn left onto Route 50. Follow into Easton and turn right on Goldsborough Street. At the second traffic light, turn left onto Harrison Street. The Tidewater Inn is on the left, at the corner of Dover and Harrison Street.